In April 2017 the Federal Emergency Management Agency (FEMA) produced new Flood Insurance Rate Maps (FIRM). 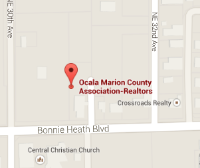 These maps placed more properties within the City of Ocala in Special Flood Hazard Areas (SFHA). The City of Ocala recognizes that the housing market has increased recently and more people are purchasing properties within the city limits. To help you, the City has provided an FEMA Informational Handout that advises potential buyers to investigate the flood hazards for a property before purchasing it. If you would like to view the flood zones located within the City of Ocala, you can do so by using the “FEMA Flood Map” located at http://www.ocalafl.org Hardcopies of the FEMA FIRM panels (dated 1978 to 2017) are located at the Public Works Department for your convenience. For more information on informing your clients of local flood hazards, please visit the NFIP’s website, http://www.floodsmart.gov, or FEMA’s website, https://www.fema.gov. Marion County Growth Services offers resources for residents for property in the unincorporated area of Marion County wishing to learn more about their property’s flood risk. Growth Services staff can help citizens determine whether their property is located in a flood zone, provide information about Marion County’s Flood Insurance Rate Maps and special rules for building within a flood plain and provide copies of elevation certificates currently on file. Residents can reach Growth Services staff by calling 352-438-2675 or visiting in person at 2710 E. Silver Springs Blvd. Email requests can be sent to Zoning@marioncountyfl.org. Citizens can also contact the Federal Emergency Management Agency, which oversees flood insurance programs at 877-336-2627, the National Flood Insurance Program at 888-379-9531 or an experienced insurance agent of their choice. A charge of $30 is applicable to flood zone determinations in writing. 2017 Update: Marion County started imposing transportation impact fees in 1990. Those fees were then suspended from 2010-2016. The commission resumed charging the fees in January 2017 but, in consultation with local builders and the Ocala/Marion County Chamber & Economic Partnership (CEP), decided to impose only a discounted rate: 20 percent for residential projects and 11 percent for commercial. Last week a hearing was held for regarding the increase of these impact fees. At the hearing county staff, recommended that commissioners gradually increase Impact Fees over the next five years, but the commissioners unanimously agreed to keep the fees where they are currently. And they further agreed to schedule some workshops to decide how to proceed.